Shaw was unfortunately forced to retire from football late in 2016 due to health-related concussion issues. The Club has retained Shaw on its rookie list for administrative purposes to protect his access to health and welfare benefits. Started the year in the rehab group after major hamstring surgery in September. Diligently went about his recovery and made his football return for Adelaide’s SANFL team in Round Eight against Central District. The athletic defender was fantastic in his comeback game gathering 23 possessions, nine marks and a team-high five rebound 50ms. Shaw continued his good form in the SANFL and was rewarded with promotion to the senior side in Round 17 versus Gold Coast. 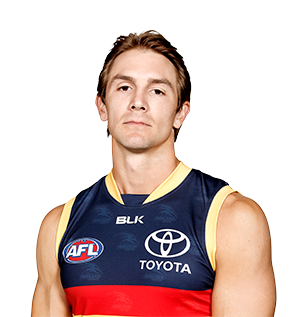 He made another AFL appearance in Adelaide’s win over Brisbane in Round 21 and will be looking for an uninterrupted run in 2016. The luckless defender enjoyed a promising start to the 2014 season, playing in five of the Club’s opening seven games before being struck down by a chronic hamstring complaint. Shaw showed strong SANFL form upon his return and helped the SANFL Crows to wins over South Adelaide, Woodville-West Torrens and Glenelg in the second half of the year. 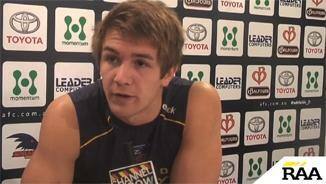 Shaw was recalled to the AFL team in Round 21, but was again hampered by soft-tissue concerns. Shaw booked in for corrective hamstring surgery in September. Shaw endured an injury-ravaged 2013 season. The athletic utility sustained a serious hamstring tear at training early in the year and spent two months on Adelaide’s long-term injury list as a result. 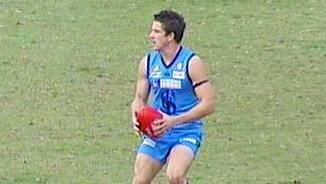 Shaw returned to play two AFL games in the latter-half of the season. The defender spent time training with the forwards and will be hoping to re-establish his place in the team in 2014. Overcame chronic injuries to make his long-awaited AFL debut against Greater Western Sydney in Round Four. Shaw suffered several minor setbacks throughout the season, but showed enough to suggest he could forge a strong partnership with Daniel Talia in defence in the years to come. The athletic tall earned a NAB Rising Star nomination in Round 21 and agreed to a new two-year deal with Adelaide. Shaw had a slow start to his second year at West Lakes after an interrupted summer, but worked his way into form at Glenelg in the second half of the year, impressing in the Club’s elimination final loss to South Adelaide. At 193cm and 89kg, the athletic 20-year-old has the versatility to play in a variety of positions.